This beautifully illustrated piece contains a r�sum� of Professor Crooks' principle lectures and papers on the fourth state of matter, that is to say, plasma. The material was presented in 1878 & 1879 before the Royal Society of London and British Association for the Advancement of Science. Sir William Crookes was born in London on June 17, 1832, the eldest son of a tailor, Joseph Crookes, and his second wife, Mary Scott. His early school years were spent at a grammar school in Chippenham, but his study of science began at 15 when he entered the Royal College of Chemistry in Hanover Square, London. There he studied under organic chemistry professor, August Wilhelm von Hofmann and held the position of assistant from 1850 to 1854. That year, he took a position as superintendent of the meteorological department at the Radcliffe Observatory in Oxford and in 1855 was appointed lecturer in chemistry at the Chester training college. The next year, Crookes married and returned to London to write and do independent research and consulting work, while continuing his academic career. In 1859, he began the Chemical News, which he edited for many years. 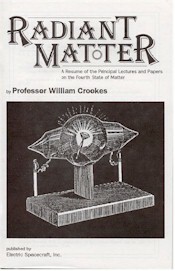 Biographers have stated that Crookes is best known for his experiments and material discoveries. His first great discovery came around 1861, when he announced that he had isolated a new metallic element from the waste of a sulfuric acid factory*thallium. His reputation was solidified and in 1863, he was elected to the Royal Society. His interest then turned to two areas of research which occupied his attention for several years*the properties of highly rarefied gases and the rare earth elements. His work with thallium led him to the first field of investigation, and he soon invented the Crookes radiometer. More important, however, were his experiments passing electrical discharges through rarefied gases, whereby he discovered cathode rays. His work in separating rare earths also provided new insight into an obscure area of inorganic chemistry. Around the turn of the century, Crookes turned his attention to the newly discovered phenomenon of radioactivity, and in 1900 succeeded in separating uranium into "-emitting and $-emitting portions. He followed this feat with the observation that when "-particles impact zinc sulphide, a minute scintillation occurs. Using this discovery he developed one of the most useful methods of measuring radioactivity. Crookes died in London on April 4, 1919 at the age of 87. Though he conducted many original experiments and made several important observations, his interpretations of his findings rarely found acceptance. 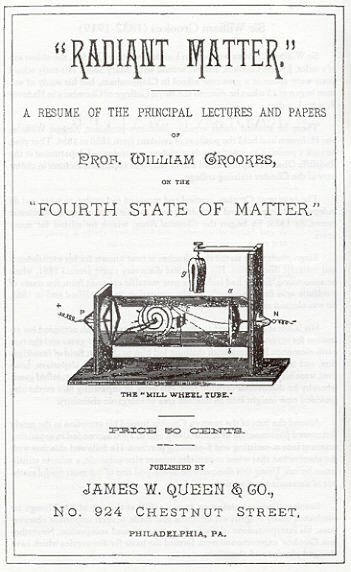 Nevertheless, Crookes' experimental work formed the basis for discoveries which have changed physics and chemistry.